Weighty Matters: Badvertising: Does Kellogg's Lead the World in Nutritional Bafflegab? 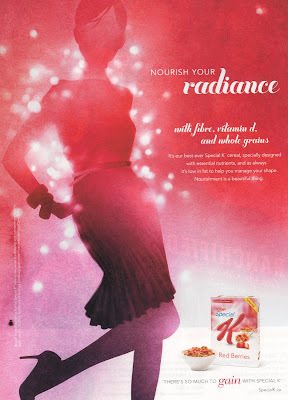 Badvertising: Does Kellogg's Lead the World in Nutritional Bafflegab? "specially designed with essential nutrients"
"nourishment is a beautiful thing"
Really? Nourish your radiance? And you're supposed to nourish it with Special K? You know what I think's a beautiful thing? Advertisements that don't rely on made up nonsense to try to sell food.